Tobins' Tastes: Win A KitchenAid Stand Mixer & A Target Gift Card! 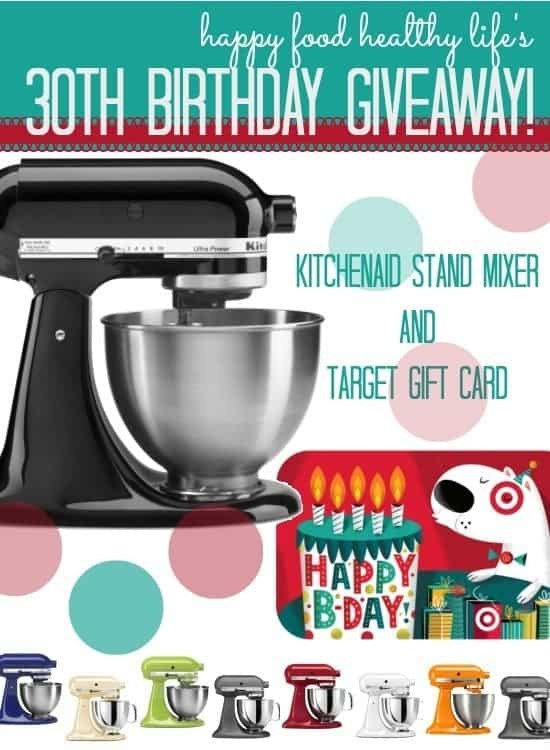 Win A KitchenAid Stand Mixer & A Target Gift Card! Happy 30th Birthday to Holly from Happy Food, Healthy Life! Holly is one of the many amazing bloggers I have gotten to know through participating in Online BlogCon and a bunch of us have joined in to help her celebrate. This giveaway just happens to be for two of my favorite things in the whole world; a Kitchenaid Stand Mixer and a Target gift card! Funny story behind my Kitchenaid Stand Mixer: I had wanted one for as long as I could remember but couldn't bring myself to buy one for no reason. My then boyfriend/now husband decided that since he wasn't ready to propose to me for my birthday in 2010 (even though we had been dating for 5 years) that he would buy me one of these babies to distract me from the lack of a diamond ring in my near future. So, make sure you use the Rafflecopter widget below to enter to win one of your own plus a Target gift card so you can buy fun stuff to make with it. Make sure to do all your entries before the giveaway ends on 9/13. And while you're at it, please stop by Happy Food, Healthy Life and wish Holly a Happy Birthday!